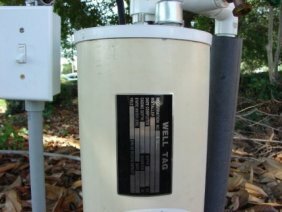 The well tag is typically a small (3 x 5 inch) metal plate attached to the portion of well casing that protrudes from the ground. Information on the well tag includes: well driller registration number, installer/driller name, date completed, depth (feet), casing depth (feet), diameter (inches), static water level & date measured, and the yield (output) of the well in gallons per minute (gpm) or specific capacity. Well drillers typically attach the tag to the casing with tape, and this often covers the specific well information stamped onto the tag.